The Sonisphere 2012 line-up was revealed last night and our pick of the planned performances has to be Mastodon playing TG's 2011 Album Of The Year 'The Hunter' in its entirety on Sunday (8 July). In what is a Sonisphere exclusive, the Atlanta four-piece will air all 53 minutes and 13 tracks of their critically acclaimed fifth album at the Knebworth festival, including latest single 'Dry Bone Valley' (ball-trippingly weird video above). 'The Hunter' material drew the most favourable reactions on Mastodon's recent UK tour, plus it sounded phenomenal, so we reckon their set could prove to be the highlight of the event. 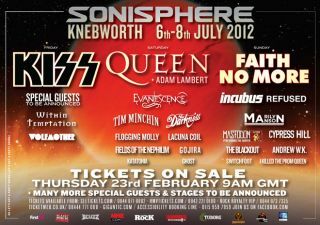 Among the other acts announced for Sonisphere 2012 are headliners KISS, Queen (featuring Adam Lambert) and Faith No More, as well as guitar-y treats in the form of Wolfmother, The Darkness and Refused. Incubus, Marilyn Manson, Evanescence and Tim Minchin will also play across the weekend. Check out the full (to-date) line-up poster in the gallery above. Tickets for Sonisphere 2012 are due to go on sale this Thursday (23 February) at 9am.